Well, apparently nothing else in the world any more is free either. 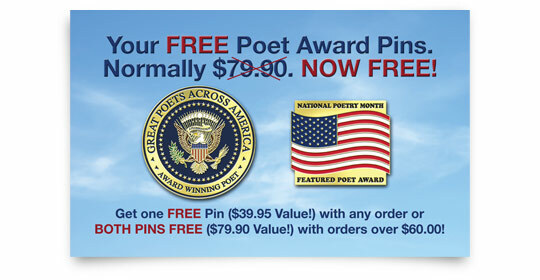 As it is still in the month of April, and April is National Poetry Writing Month, I received this offer. It came because I had entered a poetry contest last year, and according to those who held the contest, it was okay for them to let me know that even though I didn’t win their contest, I am still one of the “chosen” authors to be published in a book of poetry that will be distributed nationwide. According to their e-mail, its a “big deal”. I wonder how many millions of other people received the same e-mail as I did? I can get these really neat pins, for FREE! But that’s only if I spent about $60 (US) on their products. Mainly if I buy two or more of their upcoming published books of poetry. I was told that my poem was especially chosen, and therefore I had until the end of next month, in May, to submit my poem. After all, $10,000 will be shared! So I was beginning to think, “Why not?!?”. And then I clicked on their link to submit the original poem that I had entered into the old contest. But, what happened to the old poem? I had 37 maximum lines of poetry to write in order to make my submission. Shouldn’t they have already had my poem in hand? And what of these really neat pins? Yeah, I think that they are really cool looking and all. But you want me to spend money in order to receive them? Since when in the history of mankind and language is this “FREE”?? Not only am I now stuck with these random Poetry Contests just itching to get me to enter, since I’ve already done it once. I didn’t think that my contest entry from the first time was going to win anything. But my mailbox and my inbox both kept telling me that I’ve won. I wonder how many of those that they sent out because when it kept showing up in my mailbox, the postage said “Bulk Rate”. And so you know that I was not as special as they were saying that I was. Someone else was getting the same message as I was. I didn’t buy the original published works of the contest in the first place. I wasn’t going to pay near $50 (US) just to see my poem published. I could have just as easily posted it here in this blog and voila! !… published. All I would have to do then is hit the “print” button. But it just kills me to the point of getting my eyes stuck rolled in the back of my head when I see those words: FREE with purchase. If I have to purchase something, then you can bet your last penny, ITS NOT FREE!!!! So here’s my poem submission, and my thoughts about your “special offer”. Now that the memorial service for my brother-in-law has come to an end, I will begin the process of mourning and grieving for those that I have lost. Several in the past few weeks. Including keeping the memory of someone that I knew that I heard the news that they had passed away, just a few hours after I returned home from my brother-in-law’s service. I have received many supportive words from many people. Some that I do not know, and from others who do not know me well at all. But whether or not I know them, or they know me is not the point. The point is that they were strong and kind and caring enough to express their condolences to me over these painful weeks. Losing someone is never easy. Knowing what to say to someone who is experiencing grief and loss isn’t easy either. So then, in my grief-stricken state I am reminded of hearing another sentiment that has always made me stop and wonder. And it goes all the way back to the time when I lost my mother. I haven’t heard that one as much now as I did when I lost my mother. Back then I was only a child and I didn’t really think about it until later. I feel that it is an expression that is too vague. Too cryptic. 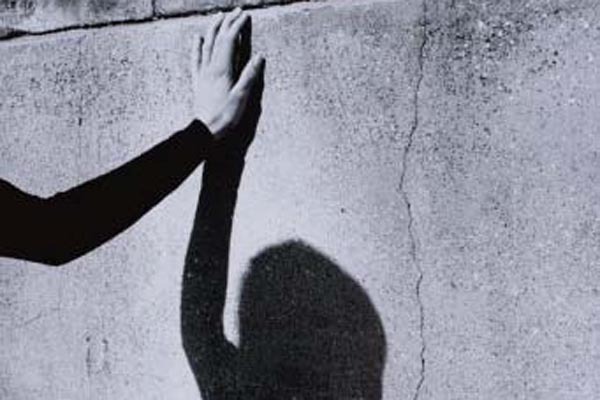 When I lost my mother, I grieved in my own way, and it took years to do it. So then when I was finally in need of anything or something, I would remember those who had said that phrase to me and would ask them for their help. But to my distress as a young child, I would come to find out that those who had said those words to me, weren’t really helpful or willing to help at all. And of course that’s not what they were saying. But it felt that way then. 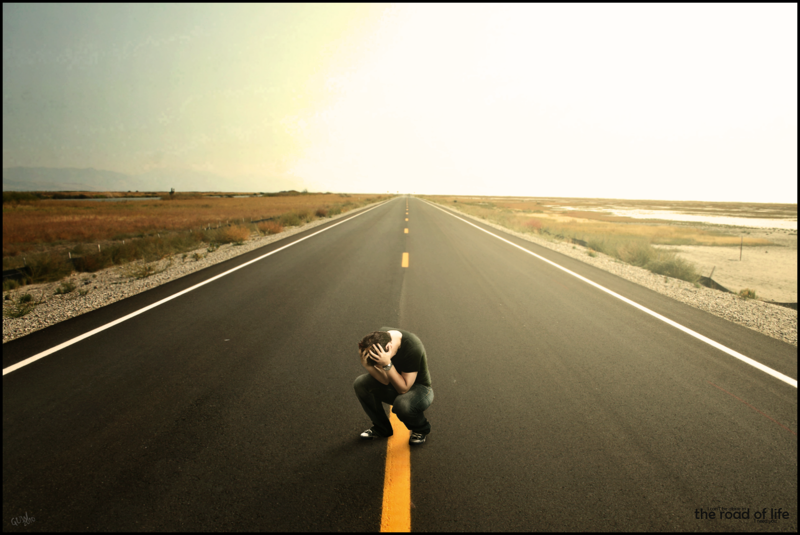 Once I was sent away and rejected, I began to feel bitter. I began to hate those words. And I wondered (and still do today sometimes) if anyone actually who has said that to someone who was mourning, had kept their word and gave that person help in their hour of need. That expression was more specific! If I needed TO TALK. And it gives the parameters of what they were willing to help with, if I was needing help. But let’s go back again to what I was saying before. Human nature is imperfect. And people go through grief in different ways. If we knew exactly what it was that people needed in order to be comforted during their time of loss, we would offer exactly that and nothing more. Because we would know that they do not need anything more. But we simply do not know because of the fact that we all have different needs when we mourn. And that really does include not really knowing what to say to someone. So these common expressions of sympathy are the ones that we use. I am more appreciative of those who have sent their condolences now, than when I was younger. And should the time come that I DO need something from someone, then I will go to them. But for now, all the thoughts, love, and prayers have been appreciated beyond any words that I can come up with to show my gratitude to everyone who has shown their condolences to me. A little while ago, I was talking with a friend of mine and she referred to me as a “renaissance man”. It floored me. It confused me. It made me filled with wonder. I simply had to ask what in the world made her think of that. She answered with a list of various experiences, and knowledge over various subjects, and added in a few talents and abilities. More or less. But I couldn’t help myself to wonder why the term “renaissance man”? I had to research it. So then I found a basic definition that was helpful enough to get rid of the haze and have me understand what she was talking about. 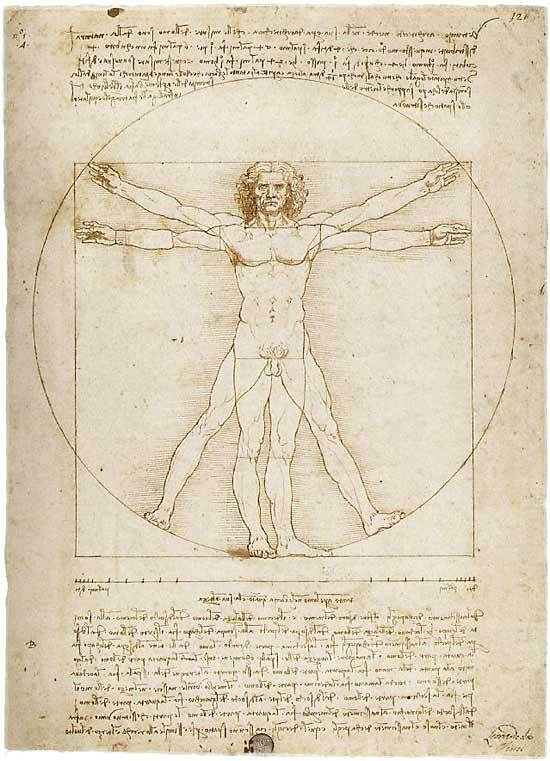 A “renaissance man” (or a polymath as the term was used in Ancient Greece) is a present-day man (or woman) who has acquired profound knowledge or proficiency in more than one field. After a few restless nights and days, I thought about just how I could fit this definiton. I know how to speak in several languages. I play the sport of sledge hockey. I know a lot about music. And I was told that I had the capability to carry on a wide variety of conversational topics, instead of just dwelling upon one at a time. It was interesting to me, but I was not sure if that “qualified” me as a “renaissance man”. Even if the modern day. I need an example. So then I found a list of people who are considered either “polymaths” or “renaissance men”. Suddenly, I felt the burning pressure. How in the world could I have been able to stack up to these men throughout world history? And then it had fallen upon me. I didn’t have to. I had simply received a compliment. Because in her eyes, I AM a “renaissance man”, and in my OWN right and merit. What an awesome feeling it turned out to be! It is the best compliment that I have ever received in my entire life. The problem with is, is when she had said it to me… the only thing that came to mind was Danny DeVito. 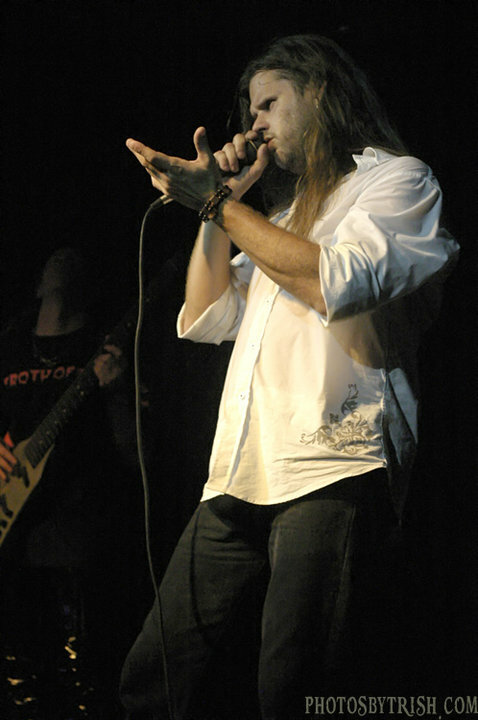 I want to take this time to personally give the lead singer of SIX MINUTE CENTURY, Chuck, the best birthday wishes possible! He and I have grown as friends over the last year and I am thankful for him to be one of the important role models in my life. Not only does he have such an amazing voice, but he’s also got so many talents and great qualities that makes him so awesome as a person. I am glad that he is who he is. He is someone that I do not mind looking up to. I know that the band will have a show to celebrate his birthday tomorrow evening, and unfortunately I will not be able to attend. But instead, I wanted to give him this public shout-out and be in hopes that he’s had a terrific day. And to know that soon, I will be able to attend another show in the near future. So until I am able to get there again, HAPPY BIRTHDAY BROTHER!! So then let’s get right to it!! Participating in this tournament meant that we were guaranteed to play at least four games. Five teams total in the division. And so this is my experience and perspective for the road to winning the Bronze Medal. Game #1- G.L.A.S.A. vs. TSH. Final score: 13-1. Yep, you read right. It would be the largest margin of defeat that we would endure. Many things were a factor in this eye-opening game. #1- We had never played in a tournament like this before. #2- We did not have a goalie. Instead, someone volunteered to take up the position who in their own hockey experience, never played that position before. We were unarmed with very little defense to protect our goal. We had a lot of mistakes and basically this game, we took the loss. Team leaders and supporters continually reminded us that we did score one goal, and ruined Chicago’s shut out. We would shake the cobwebs off, learn from our mistakes, and move on. Game #2- Buffalo vs. TSH. Final score: 2-1 (SO). Victory. We had someone coming in as a goalie this time, and that player actually plays goalie. We also had our first taste of what it was like to be winning in regulation, but Buffalo came back and tied it which caused the game to go into sudden death by a shoot out. It began with a three man shoot out for each team, and it was still tied. So then each team went to the bench and each player took a shot at the goal until a player scored. My chance at the goal didn’t get off the ice and into the air and so it was easy for the goalie to just put his glove down and stop the shot from going in. Ending the first day of competition with a WIN was a great feeling. Our tired bodies enjoying the fact that the first game of the second day would not be until the afternoon. We had a player in goalie, who actually was a goalie. The player was actually playing for TWO different teams in the entire tournament. My hat goes off to him for being so tough!! Game #3- Minnesota vs. TSH. Final score: 7-0. Personally this game was probably the beginning of my physical and mental exhaustion. It was unfortunate that minutes before the game against Minnesota, I would find out that my brother-in-law had passed away the night before and I had no idea about it. Team supporters were discussing the sad news and assumed that I had already known about it. But I had not. I was fortunate enough to be able to concentrate on the game while I was on the ice long enough to put aside the sudden news of my family’s tragedy. Minnesota was a team of all teams. Expected to win it all. (And they did.) We played them very tough. At that point, any other team that Minnesota played… they gave them a serious beating. But when they played us, Minnesota had fewer goals scored against an opponent. And we held them to seven. If there was a game that I would have guessed we would have been beaten 13-1, it would have been this one. But I was wrong and I’m glad that I was. One memory that really sticks out in my mind is that while we were getting beat by Minnesota, a female player scored on us and she turned around and filled the entire ice rink with her giggling and laughter, so proud of herself for scoring a goal. Everybody there heard it. She was bouncing up and down in her sled… it was a priceless moment for her. I had to skate by her and tell her “nice shot!”. I’m sorry, but it was too cute and funny. Game #4- Florida vs. TSH. Final score: 1-0 (SO). Another game that went into a shoot out. The three man shoot out produced no results and both teams actually went through their entire benches before finally our team cycled through to the top again and then scored, ending the nail-biting overtime period. My chance to win it all had failed because I skated too close to the goal and the puck didn’t have a chance to gain any speed or air to get passed their goalie. This game was essential for us to win. If we would have lost, we would have been sent home. But we won, and then an hour or so later, we were back on the ice once more to play in the semi-finals. Going into it with a record of 2-2. A few players from Florida congratulated us on our win and one even said that it was worth the elimination to have been a part of the extended and grueling overtime period as he laughed about it. Game #5: Semi-final- G.L.A.S.A. vs. TSH. Final score: 2-0. This game should have gone into our third shoot out of the tournament. But there was one major problem. The officials didn’t know what they were doing! Chicago’s first goal was crap. They took a shot at the goal, and our goalie stopped it. But then the player who had taken the shot ran right into our goalie and knocked him over. The puck sputtered behind our goalie and then Chicago tapped it in. But it should not have counted and the call should have been “goalie interference”. Being down early kind of worked its way into our mentality, but we stuck to it and fought our hardest. Even though we did take shots at the goal. And that kind of irritates me as well. The website that keeps tracks of the stats throughout the entire tournament said we had NO shots on goal. I had a couple, so that’s bull. One game, I’m not even listed on the roster and I was there playing. And they had me as goalie for the first game, which I was not. But I will digress and get back to game five. With less than two minutes left in regulation, the most unbelievable chain of events happened that contributed to the 2-0 loss. And yes, I took this very, VERY personal!! Let me draw your attention momentarily to the image of hockey sticks that is used when playing the sport of sledge hockey. 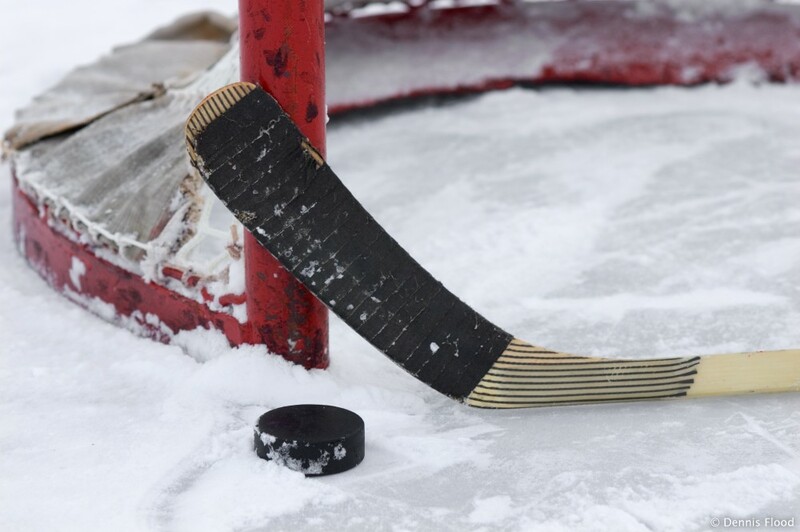 The metal picks on the end of the stick are the device to help propel a player across the ice as they remain seated in a sled. These picks are very sharp and they have to be, to be able to dig into the ice and move the player along. I was in the offensive zone and Chicago was trying to get it away. I struggled in a physical battle for the puck and fell over in the sled. Falling over happens a lot, that’s just how it goes. But what DOES NOT happen, or SHOULD NOT happen is that these sticks are used as a weapon. I was stabbed in the back with a stick with the metal picks coming down into my body. I did have the essential protective gear and equipment on. But with enough force behind the swing… I felt it. I’m laying there on my side, fighting to get the puck and I’m stabbed! I noticed that an official was near by and I took advantage of it and screamed out bloody frickin’ murder when the offense happened in order to get the attention of the officials. So yeah, I played it out and whined on the ice. The play was called dead by the whistle, “Slashing” was called for a penalty for G.L.A.S.A. #23. They made it a five minute penalty rather than a common two minute penalty because of the seriousness of the offense. #1- The scoreboard showed that the five minute penalty for our team and not Chicago. #2- Player #23 was NOT pulled out of the game to sit in the penalty box, instead they pulled out someone else. Again with the cheating and stupid officials because they were idiots and didn’t know what they were doing. With only less than two minutes left, we pulled out our goalie and had six men on the ice. Chicago got the puck and scored on our empty net to make the score 2-0. It was #23 that scored on the empty net, and he should have been pulled out of the game in the penalty box. But no. That clinched their victory over us. G.L.A.S.A. would go on to face Minnesota in the Championship Game. And we were going to the Consolation Game. In which we met up against Buffalo again. Game #6: Consolation- Buffalo vs. TSH. Final score: 3-0. Third place on the line. Our game continued to improve more and more. We were not called for the same kinds of mistakes as we had been in our first two games. We jumped ahead early 1-0, and we never looked back. Buffalo took out their player from the goal and he played as a forward late in the third period. But we would score twice on their empty net late in the game, clinching our victory and Bronze Medal. When it was all said and done, our team couldn’t have been happier. There was a bit of a discussion about had the officials not cheated during the semi-finals, of whether or not the Silver Medal would have been “given to us”. Well I said that we would have received the silver for sure, because we were not going to beat Minnesota, but we had earned the right to play for it. All in all, everyone on the team, the coaches, the parents, the supporters were happier than pigs in mud about our tournament results. Not one person complained or groaned about our performance during the Consolation Game. So now we know what its like to travel. We know what it is like to travel AND participate in a tournament and play at a higher level than what we have ever done before in the past. We have that knowledge, experience, and a higher ability to play with other teams from across the nation. Something that none of the team players had ever had before. We know that we can do it now. And we have proven that. Coming home after a victory is always a plus. Third Place couldn’t have been any sweeter. It is going to be something that everyone is going to remember for the rest of their lives. Because I know that I sure will. I can finally say that I have some experience playing sledge hockey at a much higher level than ever before. 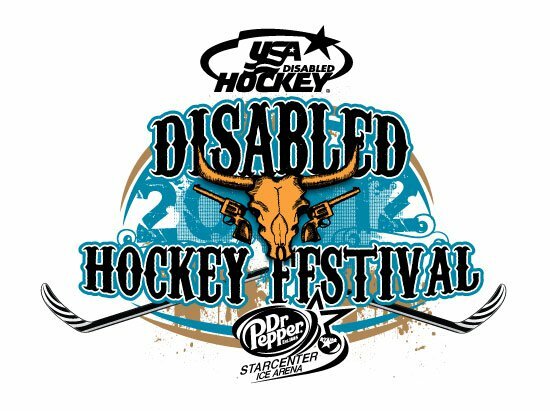 This past weekend, I made the difficult decision to go ahead and go out of town to play at the 2012 USA Hockey Disabled Festival in a tournament with players from both my team and the team from Houston put together as one rowdy bunch on the ice. It was a break that I was so desperately needing, considering the month I’ve gone through. And even though I did have so much fun playing in the tournament, I cannot escape the realities of life and human existence. But I have that experience and I am glad. I believe that from the tough and difficult weekend of playing the game, we did pretty good!! The team ended up had a record in the tournament of 3-3 and received 3rd place. And when you consider that the combination of people of two teams who have never practiced together, never played together, and barely knew one another, never played in any kind of tournament before, and learned with every game that we played and we end up winning 3rd place? That’s pretty awesome!!! As you can imagine, I am exhausted from it all. But so happy. I’m not sure what is in store for us as far as awards are concerned. 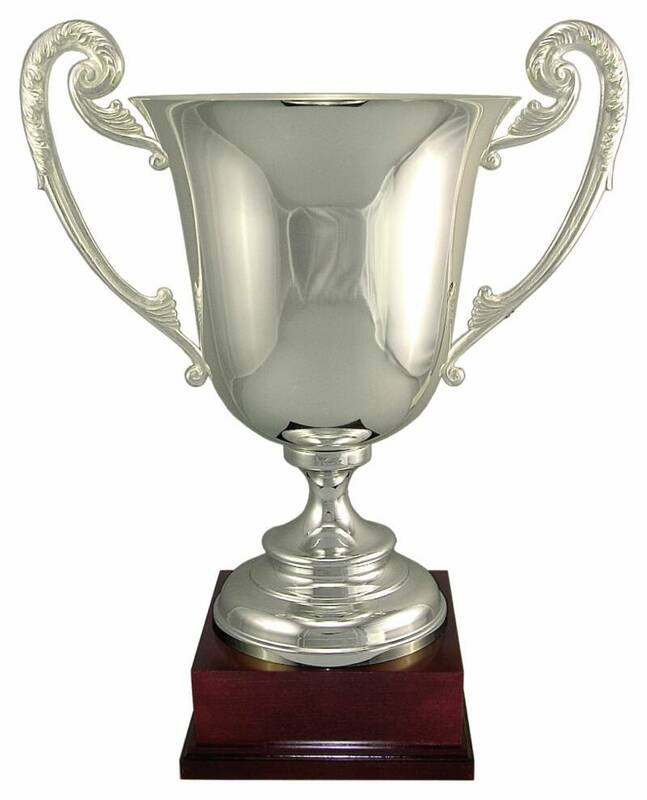 I’m told that the people holding the tournament ordered whatever it was they were going to give as awards were back ordered. I’m pretty excited about it. There is talk about possibly going to next year’s tournament in Philadelphia. Someone estimated that it would cost us about $8,000 to do it. So they want fundraising like mad until then. I wished I could remember the quote that I had read the other day about building your own legacy. For me, it really did fit well and I knew that it was powerful. And then with the news of the death of my friend, I kept it in the back of my mind. But forgot the exact quote. And I began to wonder what was HIS legacy? What was he going to leave behind for generations to remember? Come to find out there’s a lot of things that people will remember of him. More than any of his own neighbors, friends, and yes- family could ever think of or fathom. I think that all of us want to be remembered for something. We want to be sure that we’ve done something in our lives that it definitely made an impact on those around us, those whom we’ve met, and those whom we’ve come to love. But we can’t just build statues of everyone. There are over six billion people in the world, and there’s not enough room for six billion statues or memorials. So we have to work on our own legacy, our own destiny, as to what we will be remembered by when we pass on. I do not think that there’s anything wrong with wanting to be successful. However, success is measured differently from one person to another. And how we reach that particular goal also has its own set of boundaries and guidelines to where we can say that we were successful with something in life. Many think of people like Marilyn Monroe, Elvis Presley, and James Dean. They curved the path of their own successes and failures and came out to be very influential for millions of people of their time, even for people today. Not everyone was meant to stand beside those kinds of examples. But each person in the world is meant to mean something to another. And honestly, that’s all you really need to begin to build that legacy in which you will leave behind. Some were meant to have physical beauty, others were to be wealthy. But think about this: even though they have those things, they may not have had happiness. And if you were well known for being one of the happiest people on the planet, then that is your destiny, your legacy. And even if we don’t believe that we have reached success, there’s always going to be someone who is outside of the box who can see better than we can. Those are the kinds of people that come to conclusions of success in places where we weren’t even looking in the first place. Never dismiss what people see in you. Allow them to show you the good in yourself. Ignore the negative, and then improve upon it all. I do not know what my own legacy will be. Whether it be my passion for sledge hockey, or music or other talents in language. I don’t know. But what I can do, is work on the very best of me, and make sure that I make it even better. Take inventory of what you know you do best. And what others know that you do excel in, and improve upon it. There’s a reason why they say “the sky is the limit”. And those will be the things that people talk about for generations.